My Home and Garden: Well...who would have thought that I would find these treasures in Hawaii? Well...who would have thought that I would find these treasures in Hawaii? Sister Jess and I went out for a craft shopping trip while we were in Hawaii. We stumbled on an incredible selection of Pyrex and at the best prices we have ever seen. As usual the battle cry is, how will we get this home. After bringing home a Vitamix a couple years ago, everything seems easy in comparison. 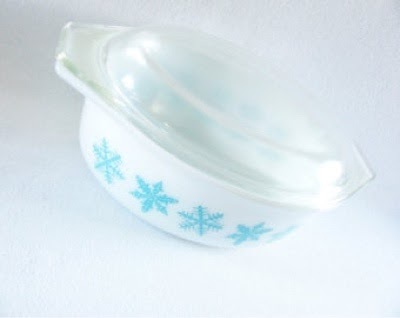 My sister bought a mint condition Friendship Cinderella Mixing Bowl Set exactly like this one. Incredible. She also got two Friendship baking dishes. One orange and one yellow. My Pyrex find!! One red bowl from the Primary Color Mixing Bowl set that my mother in law had. She had the yellow and green in mint condition, but no red and blue. The red I found is in really good shape. I also got a 1.5 quart blue on white snowflake baking dish. It is lovely and mint. This is what it looks like. 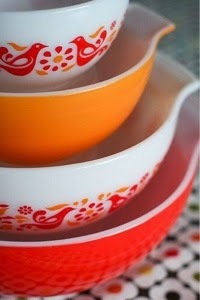 If I should win the lottery....I will be known as 'that crazy Pyrex lady'. I can hear Allan now, 'what does winning the lottery have to do with you being the crazy Pyrex lady?' Point taken. It's good to have an interest, and this seems like a harmless one. Just tell Allan to build some more shelves! Funny you say that Mark. Our new taller kitchen cabinets have far more room than needed between shelves. So most of them will be getting an additional self. Including my glass door cupboard. Hi Pam. I love old China too. If you peek into my China cabinet in the kitchen post, you can see my Wedgwood Queensware china. It is from 1943-44. I have two teapots. Also in there is my Portmeirion Rose teapot. I have been buying vintage design cotton fabric to make aprons and tea cosies to sell in my store. I found some cream colour cotton with tiny shiny gold stars in Hawaii. Won't that make a lovely Christmas tea cosy. nice, loving the new quilt as well. Thank you Alison. I really love it. and will build up your collection.